It all began when I failed to build a Trumpet Playing Robot in Geekcon. 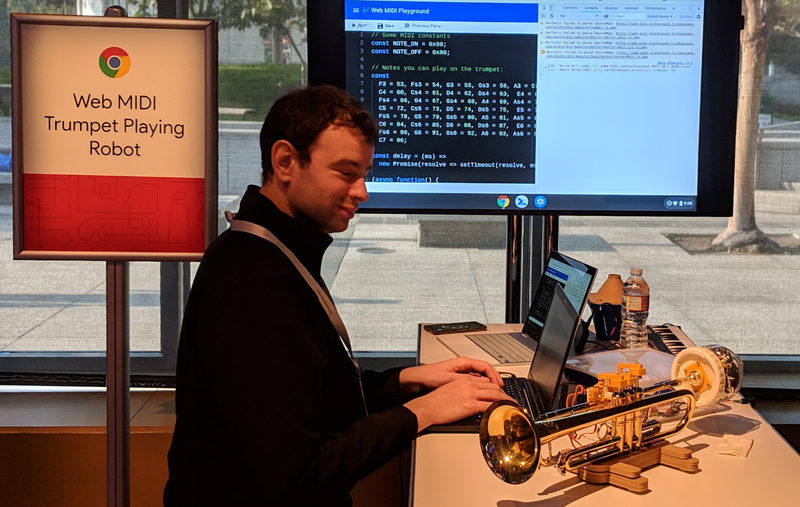 Shortly after, I was invited to present a demo at the Chrome Dev Summit, and thought this would be a great opportunity to explore a new API I always wanted to play with (literally) — Web MIDI. The result was not quite what I was expecting, as you will shortly discover. Last year, I presented the In-Real-Life Chrome T-Rex Game in the same event. It was a fun experience, and I learnt a whole bunch of new skills. It was, however, a huge undertaking for me — I spent a month of my life trying to make that happen, and fixed issues with the hardware and bugs in the software up to the very last moment, in the hotel room the night before the conference. So my goal was set to provide the “Best Experience”. Challenge Accepted! I spent the next few weeks building the electronics for the trumpet, designing a 3D-printed finger mechanism for it, and even coming up with a Web-Audio based sound engine for it. The project still consumed much of my time, but it also provided me with a bunch of post topics for my daily blogging challenge. This was obviously not the “Best Experience” for the Chrome Dev Summit attendees. As I had WiFi in the plane, I decided to spend my 10 hours flight working on that. I started by asking myself: what would be the best user interface for the summit attendees — developers? I spent the first few hours of the flight researching different solutions. After comparing several alternatives (such as codemirror, which I also used for tsquery-playground), I decided to go with Monaco Editor, which is the editor from Visual Studio Code. It provides code auto completion and types checking (thanks to tight integration with TypeScript), which is essential when exploring a new API. You can try it yourself by using the simulator version. 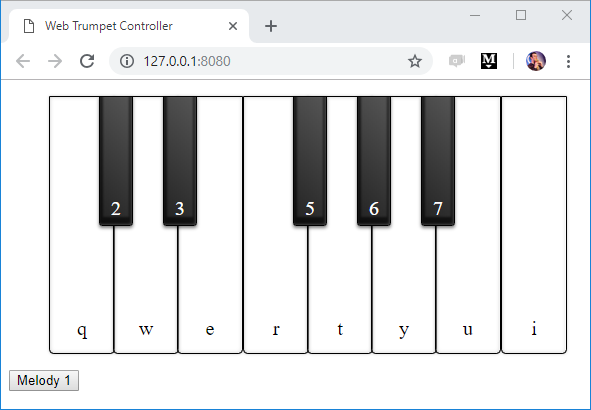 This is a special version that simulates the Web MIDI API, so I could test the code while without a real MIDI instrument connected to my computer (obviously, playing a real trumpet while in the plane wouldn’t be practical. Or would it? 😉). A couple of hours later, the project was more or less ready, and I landed in San Francisco. It was probably the most productive flight I had so far, and surprisingly I managed to squeeze nearly 1GB of data out of the plane’s WiFi (400MB of which consumed just by npm). You can find the complete source code for this project on GitHub, including some tricks I employed to visualize the code execution (more on that in a future post). Setting up in the hotel room: 2 artificial fingers ready, one more to go! A quick dry-run revealed that despite the long journey, everything was still functional, and worked well with the editor I hacked together during the flight. Ready for the prime time! Finally, the big day has arrived! That was definitely an unexpected twist in a plot! But what happened with my original hypothesis? Did people actually write code to play songs? When I wrote the “Web MIDI Playground”, the code editor for my demo, I included a sample code snippet that plays a few notes, so others could use it as a starting point. Lars took the opportunity to code “Hava Nagila”, which you can listen to in the online simulator. She also told me that it was her first time writing code with async / await, and she really liked how straight forward it was. The other attendees played her code snippet more than 50 times throughout the event! Markus was a Swiss guy I met in Espruino forums after sharing the experience of bringing back a fried Espruino board from the dead. After he learned about my project, he volunteered to help with manning the booth during the event. He spent about an half an hour writing a “Composer” snippet, that would record whatever you played on the keyboard, and would spit out code that plays the same thing. You could then copy this code and save it in your own snippet. My original intention was to have the attendees write code to play the trumpet, but thanks to Lars’es keyboard and Reilly’s piece of code, they now had an interface where they could create the code without actually writing it. It was all abstracted away! Web MIDI and Web Bluetooth working together! 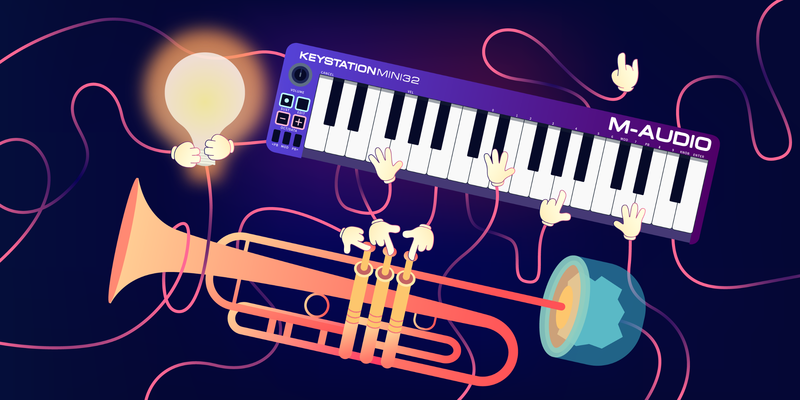 So now you could also make a disco light show while playing the trumpet with keyboard! When I started working on this project, I didn’t really know what to expect. Projects presented at conferences are usually watch-only or have limited ways you can interact with them (like the T-Rex game last year). This time, I gave the attendees the full power of a code editor, and I wasn’t sure where they will take it. I was really blown away by all of different ways the attendees programmed my robot and connected it to all sort of other MIDI devices, as well as created interesting abstractions on top of the code editor. Thank you!